Filed to: Nailed It!Filed to: Nailed It! If you’re familiar with this site, you might have read accounts of my various trials and tribulations regarding baking. Suffice it to say, I find it really, really difficult, and fail at least as many times as I succeed. 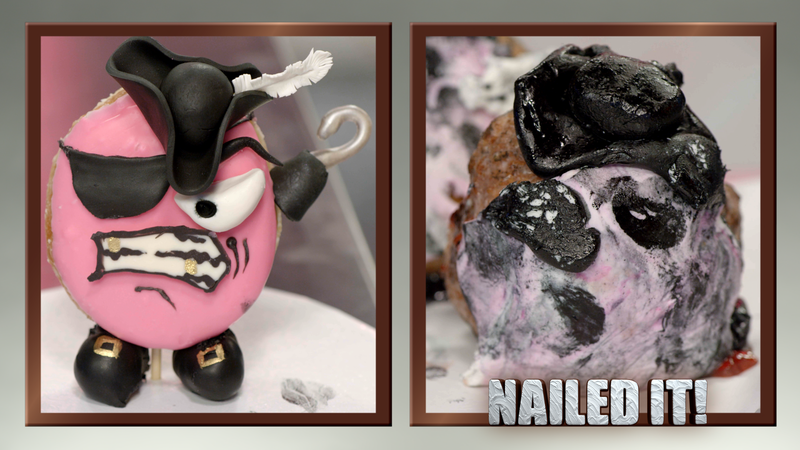 But even I couldn’t help but be heartened after watching a few episodes of Nailed It!, the new reality show on Netflix in which amateur bakers try to master impossibly difficult projects. Based off of a popular internet meme, Nailed It! almost invariably sets up these enthusiastic, trusting souls for failure. These cakes and other culinary creations require not only professional-level expertise in baking, but also gallery-worthy art skills—and some structural engineering knowledge wouldn’t hurt. These cakes are not just cakes, but elaborately decorated jelly-filled pirate doughnuts, or chocolate sculptures of various animals in hot tubs, or large pastry structures that feature Rapunzel in a tower or an actual erupting volcano or a large shark head munching on the still-bleeding legs of its victim. You would need to know not only how to separate an egg or cream together butter and sugar, but how to wrestle with fondant and sculpt a reasonable-looking dinosaur out of moldable chocolate. Mary Berry herself might need some backup. It’s the distance between the pristine professional efforts and the amateur reality that makes those various reveals such a delight, never moreso than when the two structures are pitted side by side. The whole enterprise could come off as mean-spirited, though, if not for the strength of the Nailed It! judges. Nicole Byer, late of Selfie and Mike And Dave Need Wedding Dates, is an appropriately funny host, warm even as she’s taking the piss out of a cop who refuses to read the baking instructions. 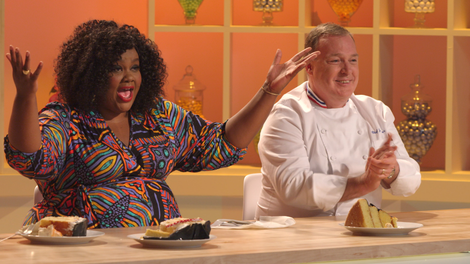 Her co-host, chef Jacques Torres, seems genuinely interested in helping these people become better bakers, as he gently lectures contestants on the importance of letting the cakes cool completely before adding the buttercream so that their structures don’t fall over quite so frequently. So somehow the guest bakers don’t even seem to mind that their final projects are destined to be held up to some level of public ridicule. At one point, for example, the cop just gives up and goes and sits at the judges table. Ridicule may follow, but the reveals offer some very, very funny moments. My family was crying from laughter over the failed pirate doughnut above by a Southern grandmother. The rotating guest judges (one per episode) seem game as well, as wedding-cake legend Sylvia Weinstock swipes licorice from the studio pantry, or food and science expert Dave Arnold whips up some cocktails while the judges wait for the bakers to finish. The winner out of the three contestants—whoever comes the closest to actually nailing these projects both aesthetically and through the success of the baking—receives $10,000 shot at them out of a bizarre party gun. And it’s hard to match the joy of the Santa Monica housewife beaming as she comes pretty close to mimicking that impossible shark sculpture. But the viewer wins as well, with at least a few guaranteed belly laughs per episode—and how many culinary shows can you say that about?